The 1U Lenovo ThinkSystem SR570 rack server is an excellent fit for Big Data, web serving, and infrastructure scale-out. It’s designed for rack environments that require peak memory and two-socket performance, flexible storage, outstanding value, and intuitive management. It can accelerate compute performance across a wide range of applications with up to two second-generation Intel® Xeon® Scalable Family processors and offers 86% more cores than the previous generation. The SR570’s faster 2933MHz TruDDR4 memory coupled with Intel® Optane™ DC Persistent Memory capacity power larger workloads,* offering as much as 1TB of memory capacity, 33% more than the ThinkSystem SR530. Adapt to changing workload requirements and boost I/O throughput with multiple NIC form factors, including LOM, ML2, and 3x PCIe 3.0 slots, as well as replaceable I/O riser cards for varied adapter slot configurations. The SR570 supports a choice of up to 10 hot-swap 2.5" or 4 hot-swap or simple-swap 3.5" drive bays. These drive bays support SAS and SATA HDDs and SSDs with up to 12Gb SAS throughput. Four of the 2.5" bays can be AnyBay, capable of supporting not only SAS/SATA drives, but also direct-connect NVMe drives for the ultimate in storage performance. The SR570 also supports one or two M.2 drives for faster, more secure OS boot. These features result in a powerful, highly adaptable, cost-efficient server with a low TCO. ThinkShield is a comprehensive end-to-end approach to security that begins with development and continues through supply chain and the full lifecycle of the device. From the data center to the edge of the network our priority is protecting your business with each product. 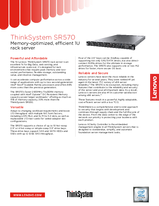 To learn more about the ThinkSystem SR570 rack server, contact your Lenovo representative or Business Partner or visit www.lenovo.com/thinksystem. For detailed specifications, consult the SR570 Product Guide. * Intel internal testing, August 2018. ‡ ITIC 2018 Global Reliability Report. ** TBR x86-based Server Report 2018. Document number DS0015, published November 28, 2017. For the latest version, go to lenovopress.com/ds0015.